← A Grocery Store Find — a Portable QRP Station Bag! I just received word from John Henry at Ten-Tec that their time frame for production runs of the Model 539 (Argonaut VI) is on-track with estimates provided at the 2012 Dayton Hamvention. We are running a small production run right now, working out the kinks of getting it into production. Most places call these “Pilot runs”. Pilot Runs basically get the factory up to speed with the units before we go to full scale production quantities. He doesn’t see any reason, at this point, why they wouldn’t hit the late fall 2012 ship dates. He also said that they’re working hard to possibly take orders for the Argonaut VI at the 2012 Ten-Tec Hamfest being held at their factory in Sevierville, Tennessee, September 28-29th. According to John, several Ten-Tec customers have said that they are going to buy a Model 539 and the Model 418 (companion 100 watt linear amplifier) when the 539 starts shipping. 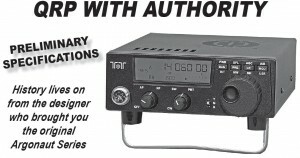 I will attend the 2012 Ten-Tec Hamfest and plan to post updates on QRPer.com from there. This entry was posted in News, Product Announcements, QRP Radios and tagged Model 539, QRP, QRP Amplifier, Ten Tec Argonaut 6, Ten Tec Product Announcements, Ten-Tec, Ten-Tec Argonaut VI, Ten-Tec Argonaut VI Updates, Ten-Tec Model 418, Ten-Tec Model 418 100 Watt Amplifier, Ten-Tec Model 418 Photos, Ten-Tec Model 539, Ten-Tec QRP. Bookmark the permalink. I’m not in the market, but nice to see a QRP transceiver in the traditional cabinet style. The others are fine for portable use but the TT would do well on a traditional operating desk. Looking forward to updates regarding performance and availability.